work together with Lebanon and Turkey in combating the organization’s terrorist activity. One of the agreement’s clauses - Ocalan’s expulsion - was carried out even before the treaty was signed. The agreement constitutes in fact a Syrian surrender to Turkey’s demands. It was reached at the end of a severe crisis, following military and political moves on the part of the Turkish government from the beginning of September 1998, along with an ultimatum from Turkish President Demirel that if Syria did not cease its support for PKK, Turkey would have no recourse but the military option. For years Turkey has tried, to no avail, to influence or to coerce Syria to cease its support for the PKK, which has put in jeopardy the territorial integrity and the internal stability of Turkey since 1984, when it first became active. The aid to the PKK was instrumental for Syria in its dispute with Turkey over territory and rights to water sources originating in Turkey. Every one of the understandings and agreements signed in the past was consistently and openly violated by the Syrian regime--notwithstanding political or economic pressures. The successes of the Turkish army and security forces in countering PKK’s activity, both in Turkey and in northern Iraq, which significantly weakened the operational capabilities of the organization. On the other hand, the feeling that the organization is on the verge of a political breakthrough - including recognition by European governments and the European Union. The determination shown during the last year by the secular Turkish regime, with the backing of the military, to fight Islamic fundamentalism. This resolve led to the removal of the Islamic Welfare Party from power and the reduction of Iranian involvement in Turkey’s internal affairs. The American example of total war on terrorism, primarily the American missile strikes on Osama bin Ladin’s bases in Afghanistan and the chemical plant in Sudan, but also the understanding of the American need for Turkish support in the Iraqi crisis. The strategic agreement with Israel, which reinforced the Turkish leadership’s feeling of Syria’s strategic isolation. Is it possible for Israel to accomplish a similar feat? Could Syria be forced to cease its support for Hizballah’s terrorist and guerrilla activities against Israel, or to give up its sponsorship of Palestinian opposition groups? Some of these groups, such as the Palestinian Islamic Jihad are capable of significant damage to the peace process. This question is of even greater import now, when the issue of Israel’s withdrawal from Lebanon is raised on the background of heavy losses in Southern Lebanon, and the United States is trying to renew the peace process with Syria. Historically, Israeli policy, and that of other Western states, including the United States has been exceedingly cautious in the face of Syrian support for terrorist organizations--an approach that has had no real impact on Syrian policy. Syria did not pay a significant price for its backing of the terror activities of Hizballah against the American, French and Israeli forces in Lebanon--activities that in the end forced the Americans and the French out of Lebanon. Israel for its part was forced to retreat to the security zone, where it continues to incur casualties. Only recently, Mustapha Tlass, the Syrian Army Commander boasted that in 1983 he gave the green light to the Islamic organizations to act against the American and French forces in Lebanon. However, he said, facetiously, he did not permit operations against the Italians because he was enamored of the Italian film star, Gina Lolobrigida! Has any Western government reacted at all to this little scoop? The United States bombed Libya in 1986 for its support of anti-American terrorist acts, but was careful not to adopt the same policy when it became clear that Syria was behind an attempt to blow up an El Al plane in the air enroute from London. All of Israel’s leaders have declared that without the approval of Syria, Hizballah could not act in Lebanon; that Iranian aid to Hizballah arrives through the good offices of Syria; that all the Palestinian terrorist organizations operate headquarters and training camps either in Syria or in the Syrian controlled Baka’a Valley. Yet, Israel has never taken any significant action against Syria, even when it was clear that it was using Hizballah as a bargaining chip in the negotiations with Israel at Wye Plantation in 1996. 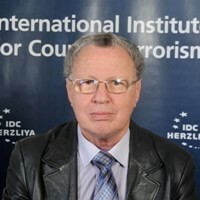 The strategic agreement between Israel and Turkey works both ways, and Syria’s apprehensions about the alliance should be exploited in the framework of the struggle against terrorism. Iran, the main sponsor of Hizballah, and Syria’s sole remaining strategic partner, has been weakened recently due to internal strife in the regime, even if this is not yet evident as regards Iran’s policy toward Israel. Israel must not repeat the mistake of engaging in negotiations under American auspices, while giving Syria a free hand to use terrorism from Lebanon to reinforce its tactical positions. Israel cannot continue to accuse the Palestinian Authority of not acting consistently against terrorism and its infrastructure, while at the same time ignoring the use to which Syria puts the same terrorism. This dual policy will become all the more acute as the negotiations for a permanent settlement draw near, and the Palestinian Authority will be tempted to use terrorism or violence to further its strategic goals. And last but not least, while the “The Lion of Damascus” may well have nerves of steel, it was shown that he knows how to retreat when he senses his adversary’s determination to put an end to the policy of blackmail. 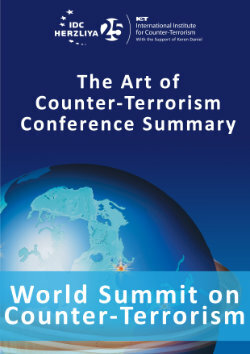 Over the past few years the public discussion of the problem of terrorism from Lebanon has centered only on two options: a Israeli unilateral withdrawal without prior security arrangements; or a withdrawal in the framework of a general settlement, which would enable Syria to reap the fruits of its occupation of Lebanon and ensure the recovery of the Golan Heights at minimal cost. The time has come to look at the new strategic map and examine other options.